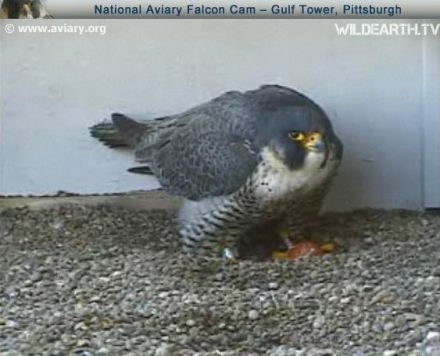 We had lots of action at the Pittsburgh peregrine nests overnight. Tasha2 at the Gulf Tower laid her first egg of 2010. 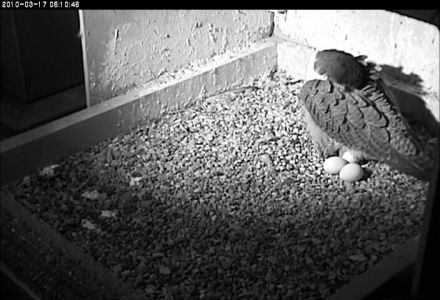 Click on her photo above to see a nighttime image of her with the egg, captured by Marianne Atkinson before 5:00am. As Marianne watched, Tasha carefully moved the egg to the right and into the scrape. In the nighttime image, the egg is the white circle and Tasha is bending her head down with her tail in the air. Meanwhile at the Cathedral of Learning, Dorothy laid her third egg as shown below. The eggs are white in nighttime pictures because they’re made visible using infrared light. In daylight the eggs are a deep red-brown color. Yes, that’s the egg between Tasha’s feet. 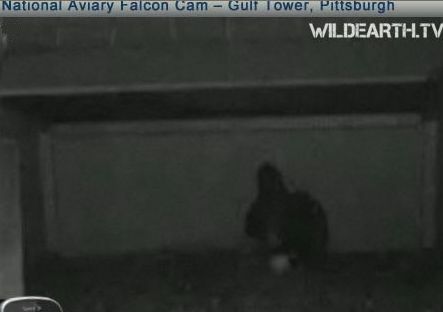 So why do Dorothy’s eggs look pink on the streaming cam at Pitt? Because the infrared light is very close and the camera can see infrared, even during the day. The snapshot cam at the Cathedral of Learning here. Now that Dorothy has laid her third egg she will likely begin incubation. See the Peregrine FAQs for more information. I’ve been watching Dorothy this year and am hoping to see more of them in person since I’m a grad student at Pitt. Last Friday afternoon I think I caught my first glimpse of E2 flying around the top of the building. from my window I can only see about half the north (fifth ave) side and the west face. I watched the webcam and listened to Dorothy from her perch and peered out my window trying to see them. I have googled and googled and even read about them being visted once by another bird that may have been one of their kids because they flew around the cathedral and behaved as if it was familiar…i think that was even here on your blog. The thing I haven’t found…what side is their nest on? I’m hoping to actually watch for them a little more this year, but it’s pretty hard trying to keep your eyes on all parts of that building! Can you share this with us? Or is is a secret to help protect them and that’s why I’ve had such a hard time? Thanks! And finally, the only reason it’s safe to say where to look is because they are very well known birds and well protected by Pitt. Now how’d I miss that post! Thanks for the tips. Unfortunately that’s the opposite side of the cathedral from what I can see from up by Soldiers and Sailors. A little warmer though and an afternoon on the plaza sounds like a grand plan. I appreciated the comment about seeing them sit on the antenna atop the cathedral too. I would have sworn I saw one land there, but without being sure I was actually seeing the peregrines I wasn’t certain. Thanks for keeping up this blog. and not have to go through WildEarth. WooHoo! Just look at the top menu. Finally got to see our guys and gals and kids-to-be. I have the Gulf Tower webcam up as I work, it’s around 11:40pm, and one of the falcons has been calling over and over since 10pm. Tasha was on her eggs, then got off, and this calling has been happening ever since. It’s not a desperate call – nor does it sound like a warning. It’s simply a repititous pattern of a series of calls, over and over. Do you have any idea what it’s all about? Did it also happen at the Cathedral before all the eggs were laid there? Dorothy has been incubating and it’s basically been silent over there all evening. Is this something the females do, until all their eggs are laid? I did hear this pattern a few nights ago at the Gulf, but I didn’t have the webcam up for this length of time. Since we didn’t have sound last year – it adds a layer of mystery. I am sure that the amount of noise we hear varies a lot and depends on how far away the mate is, how soon he arrives, and in this situation how close the birds are to the listener (microphone). Calling probably varies from individual to individual and may change as the pair becomes more accustomed to each other (number of years they’ve been together). It might even vary as the same individual ages. I am not sure if this amount of vocalization is normal for Tasha. I will ask those who have been able to hear her from inside the Gulf Tower for the last several years. Ahh, Well it wasn’t the egg. That was laid sometime during the day Friday, as I saw it in the afternoon and I saw them both in the nest box off and on throughout the day. They had the camera zoomed in a couple of times too, which has been awesome. Each falcon certainly has it’s own unique personality!! It’s been great to see Tasha in such detail. Another exciting year is starting… can’t wait!! !